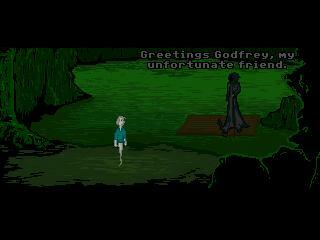 You are Godfrey, a confused spirit who has just arrived at the banks of the River Styx. There is an underworld after all, but something doesn't feel right (other than being dead). - Talk your way out of sticky situations - Utterly destroy all foes who stand in your way - End the torment of souls everywhere Play your way through The Netherworld! Edit 2018: Please be aware that this game uses a 'verb coin' interface, which means you need to hold down the left mouse button for a second to interact with the environment. "Nice graphics make this quite a fun game. Lots of dialog options. The characters were nicely made and the game play was fairly good. This game uses the Verb Coin and at first I was unaware of it. I can see users abandoning the game if they did not know of the Verb coin. The speech could only be skipped by mouse or keyboard which I found a downside. There was a few pixel hunts and some incomplete descriptions. Apart from that it was a quite a good game and could be better if the above was changed and had some minor tweaks. " This game was fun with great consistent graphics. Nice story, atmosphere and puzzles, well worth the download. The game has a really nice feeling, however it would seem more finished with longer descriptions and more explicit transitions. While some hints are too explicit (e.g. the berries-mix puzzle), other puzzles could use better hints or devices (namely, how you use the can). Most actions seem kind of unexplained. Also, there is some pixel hunting at the beginning of the game. Sound effects would enhance vastly the gaming experience. Also, please reduce the delay for the coin interface; looking at the forums it seems I'm not the only one who almost abandons the game because it took chance to find out how to get it to work. Great game, really fun. Some objects were hard to find, maybe my monitor is just dark. I heard intro and outro tunes, but wish there were some during the game, it has always been important to me for games. Good game, but feels incomplete, too many loose ends... Has Susan got no part in it other than sitting there?